I have a patch of Lemon Balm in between some flowers in my flower bed as you can see. I have always loved that lemony scent when you crush a few leaves between your fingers. I have read that lemon balm tea is very soothing. But, I wanted to learn more as I have a lot of it in my garden. 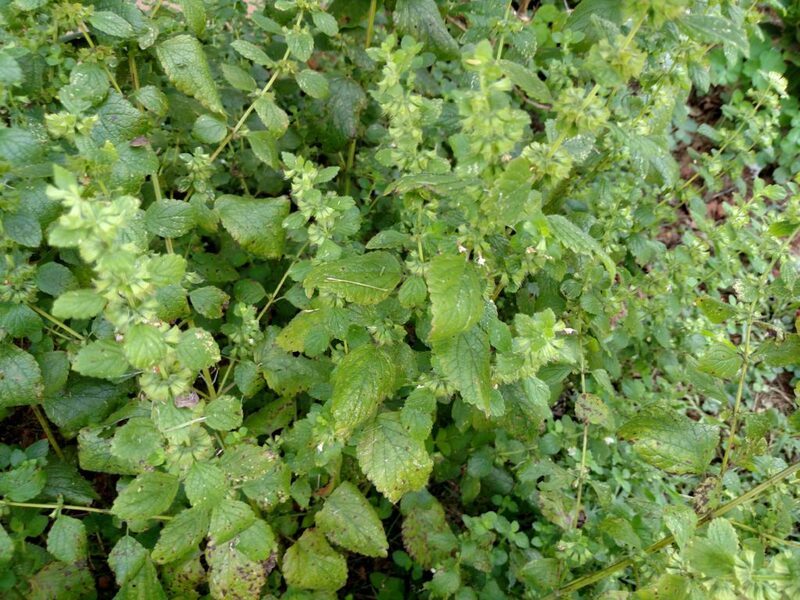 The reason it is spreading is because Lemon Balm, Melissa officinalis, is a member of the mint family. That being said this plant is a perennial and will come back every spring and is a vigorous plant and will spread into other plantings. It also is a plant that will attract bees and make them happy campers. Lemon Balm has been labelled as a medicinal herb plant because of its many uses and benefits. Lemon Balm tea made from the dried leaves is said to soothe menstrual cramps and help with digestive problems like upset stomach. The tea has also been known to relieve stress and anxiety and promote sleep. Lemon Balm also is known for its culinary uses as a sweetener in jams and jellies and as a flavoring in fish and poultry dishes. It also used in perfumes and cosmetics. The Herb Wisdom site has a very in depth page on Lemon Balm and its many medicinal uses from head to toe stating that it can help with headaches and high blood pressure to anxiety and insomnia and stomach issues to menstrual cramps to dementia. It seems to be an amazing plant that has a lot of health benefits. It can be used also in personal care products as an additive to lip balm for cold sore eruptions due to its anti-viral properties. 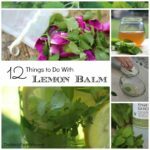 You may also want to visit this page on Jan’s site ( also know as The Nerdy Farm Wife) for some very interesting things to do with Lemon Balm. She has many interesting posts about uses for various herbs and is worth checking out. If you are looking for dried Lemon Balm leaves, seeds or Lemon Balm extract you always check out Mountain Rose Herbs as they have all of these available. I hope I have given you some food for thought and things to dig into. Let me know what you find? I grew Lemon Balm when I lived up north (Ohio). It seemed to flourish! I loved the aroma, but never realized its amazing beneficial properties. One of my goals this summer is to grow and dry my herbs for winter tea. Just picked a bunch of lemon balm. I also love lavender and chamomile and hope to make a sweet blend. Wow, lemon balm sounds amazing. Thanks for the info. Thanks for the new insight on lemon balm. I was surprised to learn it’s in the mint family.